With excitement and a little trepidation I boarded the plane at Schipol Airport. 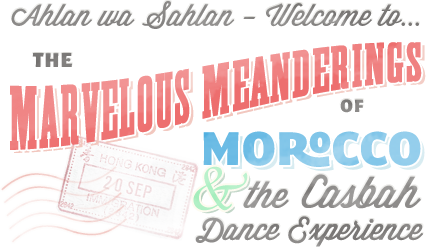 Excited about my first visit to New York and attending a week-long seminar of dance organised by top teacher and performer, Morocco. I had met Morocco in 1997 when she made her last trip to the UK although we had known each other by email since 1996. Despite all the usual fears we British have about the Big Apple, excitement won and I couldnt wait to immerse myself for a whole week! Morocco hosts two seminars a year, one in January and one in August. The schedule is organised 12 to 18 months ahead and it changes each year – i.e. you can go twice in twelve months and either repeat or have a completely different schedule. Many go every year for both sessions and places fill up 6 months to a year in advance. A very popular event! As well as Morocco herself, who would be teaching three choreographies there were also guest teachers. The seminar I attended had Michelle Sampson, a professional theatrical set dresser and costumer giving a workshop on costumes, accessories, colour combinations etc., Shakira of Columbus, Ohio taught a workshop on Zar and trance dance. Shakira is a very generous teacher and a wonderful performer who is also very busy travelling all over the US to teach, she is very much in demand. I’ve been privileged to meet her a couple of times now and her veil dance is amazing. Our third teacher was Tarik Abdel Malik. He is Morocco’s protégé and a wonderful dancer. He has been dancing with Morocco’s troupe, Casbah Dance Experience for several years as well as dancing solo and with Morocco. 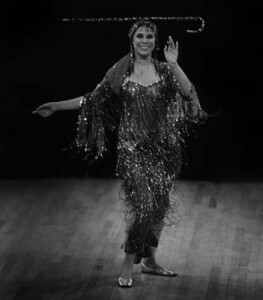 Tarik does not dance in drag as many put it, performing the female version of the dance. He carefully researches the dances that men do throughout the Middle East and reproduces them in the correct and appropriate format and setting. As well as teaching us an Oriental routine during the week, Tarik took us through Morocco’s warm up in the mornings. He is a wonderful dancer and inspiring teacher. Morocco is constantly in demand and N.A.D.A. are fortunate enough to be able to schedule a weekend of workshops plus a performance evening in November 2001. More details about the workshops and what Morocco will be teaching us can be found elsewhere in this magazine, as well as her interview in the next edition of NADA the magazine. From personal experience of this lady’s teaching, you have a real treat in store. As she teaches you new steps/choreography she will hand out titbits of information, assimilation as you shimmy! 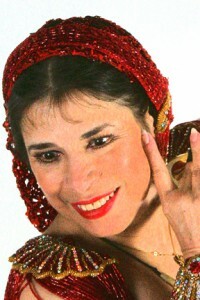 She is generous with her knowledge and her wisdom and is so happy to be sharing that with those who also thirst for knowledge of Middle East dance. I had arrived about 4 days early in order to do some sightseeing and to meet up with two other seminar attendees who I’d befriended via email. People come from far and wide to attend and my compatriots were no exception. Thania was from Brazil and Louise from Montreal. Some travelled from Europe, myself, Alison and Sohah from England and Elfi from Germany. Others from NY state, New England and Florida also attended. I learned a great deal from talking to the other dancers as well as from the seminar. We swapped information, tips, contacts, email addresses and photos. Back to the seminar! The classes are well structured throughout the day and across the week so that each day we reviewed and practised all three choreographies. The week I attended we did two upbeat numbers and a slower, dreamy number as well as some Turkish Mevlevi and the Zar dancing which Shakira taught us. Personally I found it difficult to do all the spinning and one quick glance round assured me there was no-one strong enough to pick me up if I fell over! My favourite was the slow, dreamy number performed by Georges Lammam and I only have to close my eyes and listen to the music to be transported back to Morocco’s studio with all the class moving gracefully and dreamily as one. She is a very experienced and inspirational teacher who has travelled the world to teach on request, even Down Under!. It doesn’t take long before you are under her spell. 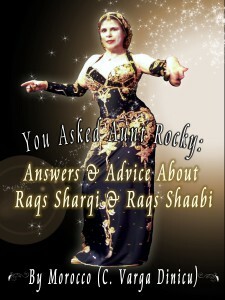 She will tell you tales of her travels in order to research dance throughout the Middle East, of her trips to Cairo, her travels in Morocco. Over the years she has developed a style of teaching which really helps you to remember those choreographies. As well as all of the dancing time in the studio, extra curricular workshops and trips were organised. In addition to the costuming tips, Michelle took us on a tour of part of the garment district to look at fabrics, as well as to the Indian quarter with lots of Saree shops selling the most beautiful fabrics. [If you ever go, try Saffron restaurant, the most gorgeous vegetarian Indian food I’ve ever eaten!  and believe me, I’ve eaten a curry or two in my life!] Back to the fabrics, one of the most helpful tips we had was about the use of colour in our costumes. It’s often a good idea to have 3 colours, a highlight, a lowlight and a main colour for the costume. On the Thursday night we were all due to dance in a showcase in a Middle East restaurant in Manhattan, the Lafayette Grill. Weighed down with costumes and bits and pieces, we got on the subway and blindly followed Morocco. It was like a sequinned version of the Pied Piper of Hamlyn leading the children away! It was wonderful to see all the different styles of dance, from American Tribal to Sword dancing and all styles in between. All shapes and sizes too which was great, and everybody looked fantastic in their costumes. On Friday morning, our last day, we had the opportunity again to review all the choreograpies, ask questions etc. When it came to to the end of the seminar, nobody wanted to go home, there were affectionate hugs and goodbyes. We had all made new friends, met up with old and of course, learnt a great deal from Tarik, Michelle, Shakira and the lady herself, Morocco.